The famous German cartridge designer Wilhelm Brenneke put an 8x64 together in hopes of getting a military contract to build a more powerful military offering to replace the 8x57. Although unsuccessful with the contract, but owing to the popularity of the 7x57, his 1917 offering of the 7x64 (the term ""Brenneke"" is often left off the name for some reason) quickly became a hit with hunters, particularly in countries that banned the use of military rounds. Its use is widespread in Central Europe. 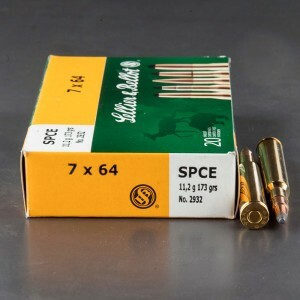 The designation 7x64 means a bullet diameter of 7mm (.284 inch) and a case length of 64mm. 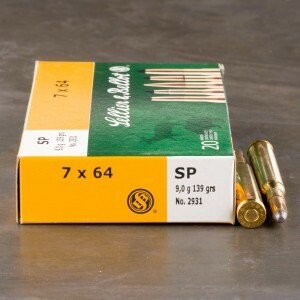 Using a 7mm bullet gives the cartridge superb ballistics as the 7mm family of bullets carry some of the highest ballistic coefficients available in their bullet weights. These bullets shoot like they are on rails! With the larger case capacity, the 7x64 is capable of pumping out lead ranging from 130 grains up to 175 grains with muzzle energies approaching 2800 foot pounds and speeds closing in on 3000 feet per second! Pretty impressive performance, right? Using the proper bullets, this dandy cartridge is suitable for almost all North American game animals.